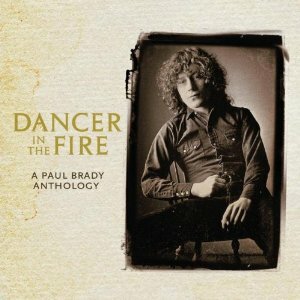 "Dancer in the fire" is a compilation of songs from Irish singer/songwriter Paul Brady. His music has varied over the years and has included traditional Irish music and folk music with varying amounts of pop or rock influences. Over the last 34 years he has released well thirteen solo albums plus a couple of compilations. When I heard that Dancer in the fire was a compilation, my initial thought was that it would be the usual sort of compilation - i.e. a "best of", but it isn't. Instead, Paul Brady has chosen to include songs that he is particularly fond of, whether they are well known or obscure, and has also chosen to ignore any songs that featured on the compilation "Nobody knows" (which was a "best of") so really this is a collection of lesser known songs that are particular favourites of Paul Brady himself. Particular praise has to go to the packaging of this album. The CD booklet is thicker than normal and features an introduction from Paul Brady and then goes on to not only list the songs that are on the album but to give a paragraph about why each has been chosen, or some background about the song. That for me was a really interesting read and is sure to interest many of his fans. I'm not going to describe the songs in detail - the CD booklet does that already, and Paul Brady fans will already know many of the songs anyway, even if the versions here are sometimes new. For fans of Paul Brady this is a very good album. For anyone else, yes its a good album, but I'd expect most people choosing their first album by him will opt for his greatest hits instead of this. I hadn't listened to Paul Brady before, but was certainly impressed by the album - definitely well worth checking out.